We are looking for one more Elite player to join our Top 5 fleet. Fleet rewards are usually claimed with 10-14 hours remaining every day. Our Starbase is almost Maxed. If you are around VIP 10, have 4 shuttles, some 5/5s, an active player and want to be in a top fleet PM me here or in game. Or talk to one of our SST fleet officers/members. We are looking for an elite player to join our top 5 fleet. Our star base is almost level 43, which is one of the top 2 or three highest in the game right now. Our fleet is made up of great people who love Star Trek. No requirements except be active, no vulgarity, politics or religion in our chat. PM me in game, or look for one of our players in UC. Thank you all! I just want to say this really is a great fleet and consider my self fortunate to be a part of it. We have no drama, chat’s just as active as UC, but more importantly, it’s not just built on good players, but good people. Anyone can build a roster of impressive crew by throwing money at it, but to take the time to help less developed players, either by deed or by word, to teach them the knowledge that’ll allow them to grow to the betterment of themselves, their squad, their fleet? Only been part of this great crew for 4 months, and if ever I had to leave, for whatever reason, I know I’d never join another fleet...wouldn’t be the same. Can’t think too many players could say the same. That’s because there can’t be too many fleets like this one. One spot in our top 5 fleet. Starbase is 60. We need an active player who can be a squad leader if needed to share. Most of our players can be a Squad leader any week. PM me here or in game. VIP 12+ and 50+ level preferred. Hi there, is your fleet still looking for new players? If so I’d appreciate a chance to join. Anyone looking to join a great fleet, this is the one for you. They’re a great bunch of lads and lassies, do the best with what ye have, no pressure to spend, and a great bunch to talk with and share info in an active fleet chat. Consider myself fortunate to have joined. Blue and greens only enough for all daily missions. Hi, I'm an active player for whole day and night, playing since April 2017. I usually spend 50-100$ a month on the game. Got a long history of multiplayer games with top achievements (wow, lol, dota1, warcraft3 tft, star trek online....) More than 20 years of exp in gaming. Im looking for top fleet in which after time I could become an officer and work to better the fleet even further. Im no stranger to any type of chat (msg, voice...) And can communicate actively almost anytime..
Oops, sorry for this.. had a bit of a transition from one isp to another..
After the event this week, we will be looking to replace ONE player who needs time to take care of family issues. 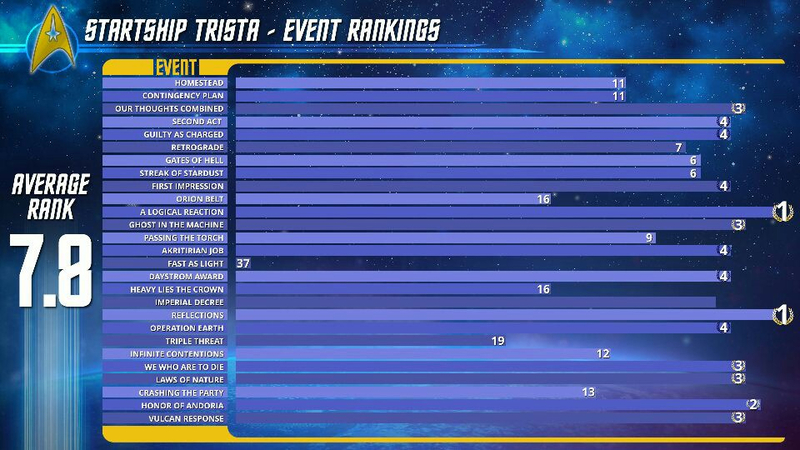 Our fleet is a Top 5 fleet, with a Starbase of 80. All fleet rewards are won withbusually 10-15 hrs renaibing. You need to be an active player, around captain level 50+, VIP 12+, with a few 5/5s. Someone who could be a Squad Leader if needed. Message me here or in game. Thank you! I have 4 shuttles and send them out every 3 hours and on the 9 hour overnight. I have 4x 5/5s. 18x 1/5s. 25x 4/4s and currently working on getting my 100 other 4s up to 100%. I have all 3*, 2* and 1*s. I have 230 crew slots. Currently at VIP 10 but working on getting to 11 with a view to get higher. I’m in the UK, so I’m on GMT. I play from 6am until midnight. My user name is King Curly. Hope to be able to join a more active fleet. Currently still in one, but happy to leave it! Just a little info on our fleet....not sure if any other fleet has a higher average. Immediate opening for a top 1000 player to join our top ranking fleet. PM me in game. I will be in UC lurking. Who made that fleet rank graphic? That is SWANK.